The Search For The Clothes of Doom! A month or so ago, I was wandering through the maze of mess known only as "downstairs" when I came upon a silvery doll about ten inches long. Picking it up, I quickly discovered two things: one– it had what was supposed to be a metallic mask fused to its face. Two–it was naked. I looked at this doll in abject puzzlement. Surely, I could not possibly be holding in my hands a naked Dr. Doom. 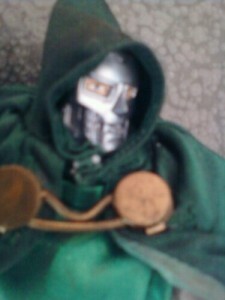 So far as I knew, we did not own a Dr. Doom toy…clearly, I am now hallucinating Doom dolls in my basement. 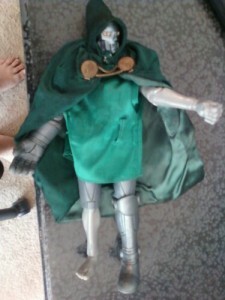 But no…it really was a naked Dr. Doom doll. Victor Von Doom Doll's underwear. As the cleaning has continued, I have found his tunic, his cloak, one boot and one gauntlet. Still to come, his belt, his other boot and his other gauntlet. Which still leaves the question…if all his faux armor gear is metallic silver, why make the body underneath grey rather than skin tone? Especially, since they went to the trouble of putting some skin tone around his still human eyes? Victor as he is now. Will the rest of his garments be found? And a blurry picture of his still-human eyes. Juss informed me that the doll was his father's and that one of the children, he could not remember which one, had undressed it. He actually said: "one of the children".